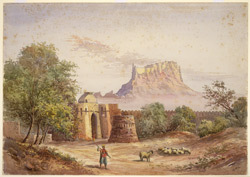 The formidable Meherangarh Fort, considered the finest in Rajasthan, was built by Rao Jodha (r.1458-89) of the Rathor Rajputs after he founded the city of Jodhpur. It stands on an isolated outcrop of rock which rises abruptly from the surrounding plain on the edge of the Thar Desert. Its high sheer walls and massive bastions dominate the city and can be seen for miles around. Within the fort at the northern end are the Old Palaces, a series of beautiful courtyard buildings, which date from the 17th century onwards. The fortified area stands to the south with a long wide terrace to the east. The palace of the maharajas is approached by a steep path along the east side of the cliff that passes through seven arched gateways. The royal complex consists of a series of apartments disposed around courtyards. The facades are distinguished by the extensive use of jalis, perforated stone screens carved with intricate patterns.